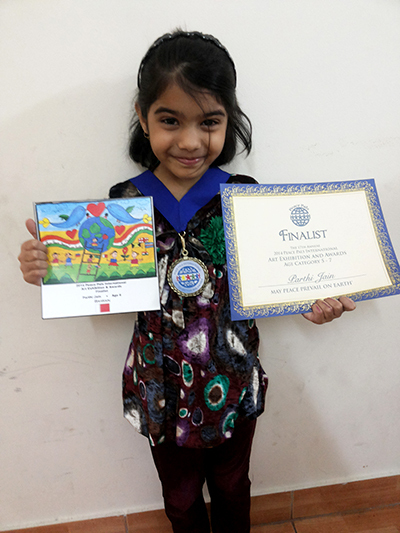 Congratulations Parthi Jain, age 6 from Bahrain who was one of our Finalist in her age category in the 17th annual Peace Pals International Art Exhibition and Awards! We are very thankful to Peace pals art international to provide a platform for my daughter to share her thought on peace. It was really a great experience for her. Once again thank you so much for the prizes sent to my daughter. She is feeling very proud, happy and excited. She loves the medal, and other gifts. Please find her photo along with the gifts, medal and her certificate.